FALCO 100 catalytic oxidizer (serial # 11-100-06) was used at a SVE site (13013 hours meter reading). This equipment was tested at Falmouth Products on 11-27-18, is in good condition (catalyst destruction efficiency is > 99%), and is supplied with the items detailed below. FALCO 300 catalytic oxidizer (serial # 18-300S-02) was rented at a SVE site (2,448 hours meter reading). 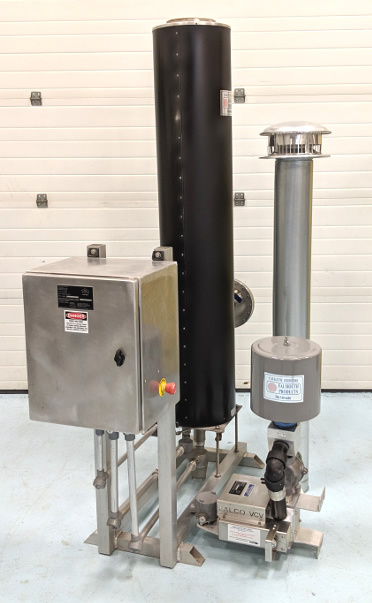 This equipment was tested at Falmouth Products, is in excellent condition (catalyst destruction efficiency is >99%), and is supplied with the items detailed below. Falmouth Products standard 1 year warranty. FALCO 300 catalytic oxidizer (serial # 17-300S-10) was rented at a SVE site (4,281 hours meter reading).